French protests against government labor reforms have led to gas shortages across the country. France can't seem to catch a break this year as it suffers from floods, worker strikes and terrorism concerns. The country welcomed nearly 85 million tourists in 2015 -- more than any other nation in the world -- but visitor numbers have dropped sharply this year, threatening the 40 billion euros ($44.5 billion) in revenue generated by tourism each year. Tourist arrivals to France dropped 8% in the first quarter of 2016 compared to the same period in 2015, according to market research firm Euromonitor International. Floods: Flooding caused by torrential rains this week have forced French President Francois Hollande to declare a state of natural disaster in the worst hit areas. Paris' mayor Anne Hidalgo warned on Friday that the floods will hurt the city's economy and tourism. The Seine -- which runs through Paris -- burst its banks and officials predict levels will peak Friday. Some restaurants along the river have been forced to close. Two famed museums in Paris -- the Louvre and Musée d'Orsay -- were forced to close Friday so that artwork can be removed from areas that are prone to flooding. Both museums will remain shut until Tuesday. The Louvre is the most popular museum in the world, welcoming roughly 9 million visitors a year. However, museum management noted in January that attendance was down in 2015 as a result of high-profile terrorist attacks in January and November. Attendance from school groups in particular fell 25%. 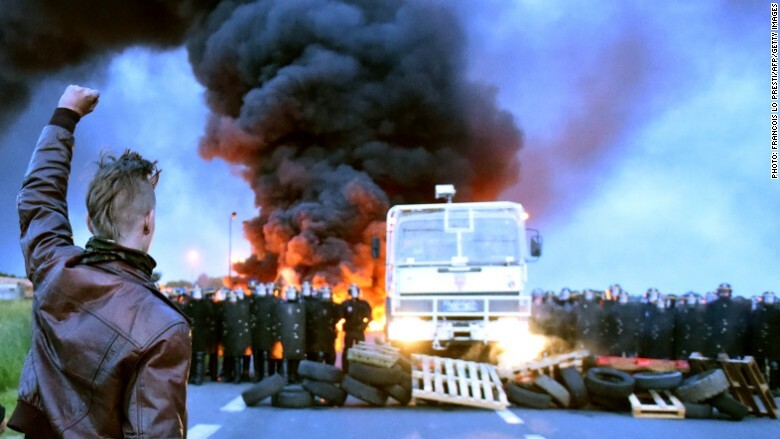 Strikes: The French government has been scrambling to keep gas stations from running dry and cities powered after workers at oil refineries and nuclear plants walked off the job in late May. Employees in other sectors have joined the ongoing strike, including transportation workers who manage the country's rail and metro networks. Two unions representing Air France (AFLYY) employees are also threatening strike action in mid-June to coincide with the start of the Euro 2016 soccer championships, which are slated to run in France from June 10 to July 10. The strikes could cause a logistical nightmare for the soccer event, which is expected to bring in a huge amount of tourists from across Europe. The strikers are protesting new labor laws imposed by the French government that make it easier for employers to fire workers and reduce overtime pay. Terrorism: France remains under a state of emergency following a massive terrorist attack in Paris in November that killed 130 people, and forced millions of tourists to rethink their travel plans. The attack came just months after terrorists targeted the offices of the satirical magazine Charlie Hebdo. The attacks in November seriously hurt airline bookings, leading Air France's parent company to report that revenues in the month fell by 50 million euros. Ryanair (RYAAY), EasyJet (ESYJY), Lufthansa (DLAKF) and International Airlines Group, which owns British Airways and Iberia, also suffered a hit to sales as passengers reconsidered travel plans because of security concerns. To top it all off, the U.S. State Department issued a travel alert this week warning Americans about the risk of potential terrorist attacks throughout Europe, even though it did not identify new, specific threats. "Euro Cup stadiums, fan zones, and unaffiliated entertainment venues broadcasting the tournaments in France and across Europe represent potential targets for terrorists, as do other large-scale sporting events and public gathering places throughout Europe," the State Department alert reads. The head of the European Tour Operators Association, Tom Jenkins, said the travel alert seemed "purposefully irksome." "It is always puzzling as to the purpose of these announcements. Such assertions would normally require a strong imagination," Jenkins said in a written statement. --CNN's Armelle De Oliveira, Ben Marcus and Lindsay Isaac contributed to this report.